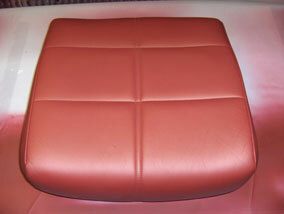 This photo shows a seat cushion we will be changing from beige to maroon. Hi! I have 2 brown faux leather couch, can i turn them white? and can i un-do it on the future? meaning turning them brown again? I'd like to know what the VOC or equivalent gauge of how toxic this product is? If you have a (even less effective) but less chemical version I would be interested to know - our kids are young, so leather is still the most practical option but they are very asthmatic and get a lot of skin reactions to most products, so we are really keen to find a solution that won't cause them any grief. Many thanks! Hi Charlotte You are welcome to send us em email regarding this .. we can provide you with all the data sheets you need. Do you reckon this stuff could turn a white pair of Dr. Marten's boots into a BRIGHT RED pair? And can it be applied without a spray gun? hi, i have a cream coloured extra large 3 piece suite, can i change the colour to white? and can i do this without a spray gun? Hi, I have an oxblood chesterfield sofa that I would like to make white. How hard to do would this be as DIYer? Hi Erica. It is as easy as you can see in this video tutorial. The colourant kits come with comprehensive instructions for you to follow. Just take you time and have a little patience. I hope this helps. Do you supply samples of the dye colours you sell? I'm looking for a pale creamy yellow but would need to see the colour before I order? Can you please give me a rough idea what you would charge to dye a 3 piece suite for me? One of the chairs is a recliner and both ends of the 3 seater sofa also recline. Thank you. Is it possible to dye deep brown sofas to a red colour at all? I have two dark green leather recliner chairs that I would like changing to black. Because I am nervous about diy I wonder if you offer a service of dyeing furniture for me. Hi there, we have a 3 seater and a 2 seater sofas. They are currently in a sage green colour but we want to change them to a dark brown colour. Firstly, how much product would we need? Secondly, if we don't have access to a spray gun is it possible to get a decent finish with the selant? I am looking to change a cream leather corner sofa to slate grey. I have tried to find examples of the dyes you sell to see if they look like they are real leather or painted. Can you share any images of this or does anyone have any specific comments on the finish etc? Hi Mark. I generally find that he appearance of the leather once it has been recoloured is very dependant on the procedures followed and the application. If you follow the instruction and take your time, you will find that that is not an issue. Have a look at the testimonials and "photos" section on the Colourant Kit page ... https://www.furnitureclinic.co.uk/Leather_Colourant_Kit I hope this helps. Hi, I have 2 x 2-seater recliner sofas, which are dark brown, and I'd like to dye them black. The measurements are approx 145w x 85d x 93h. Would I need 2 Large kits or 1 Extra large kit to cover these 2 sofas? Also, how long - approx - would it take an amateur to do one sofa? Thanks ! Hello. 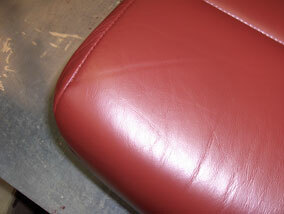 If the leather seat is new, for repainting in a different color I again need to clean the paint with leather prep? Hi, just read this tutorial, I have ordered the colourant and leather finish from you but no superseal.. Do I need this too for a colour change on car seats? Hello. I would like to ask how much quantity I needed for a medium sized car. Can you send it to Saudi Arabia? Hi Erica. 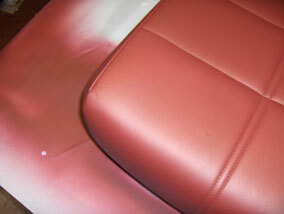 Using the colourant kit, it is possible to change any colour leather, to any colour - darker or lighter. I think that the large kit will suffice as it will cover about 6-8 sq metres. My parents are giving me an unwanted 2 seater recliner sofa and I'm very grateful. However, it is a chocolate brown colour and I would like to dye/colour it black to match my other sofa and furniture in the living room. Could you advise as to which size package I would need? I don't have the height but the width is 170cm and depth 95cm, if that gives you any indication? Thanks for your time. Hi, I have a full aniline white seatee and after 8 years it is yellowed and a few small stains. I am thinking of recolouring it to black, what would I need? hi I am trying to find someone to respray my leather lounge suite for me,do u know of anyone in Aberdeen Scotland I can contact. Is it possible to dye a dark brown leather headboard into a creme coloured one? I have wooden dining chairs with beige leather seats and backs and large nailhead trim. How would I avoid staining the wood and nail heads when applying the colorant? 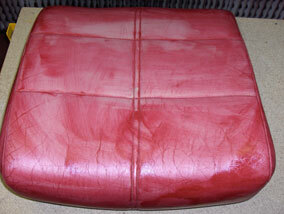 I would like to dye cream leather footstool to dark grey. The measurements are 20. X18 inches. What size of the all-in-one colourant would I need. I was recommended to use Methylated spirit to prepare leather before using dye. Does the spray gun come with colourant or can I use sponge/cloth? Must I use a spray gun? Can a cloth do the same finish? I would like to dye/paint my small leather chesterfield sofa a metalic pewter or silver is there metalic leather dye/paint available??? hello, does the dye absorb into the leather or does it leave a coating on the surface? how does it wear on a sofa as i am concerned it may peel off after use? 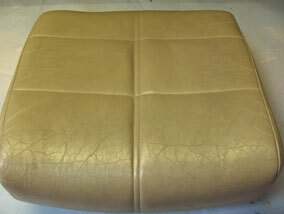 also i have a cream leather sofa and would like to change the colour as it is very discoloured and dirty - how easy is it? Would deep red be ok to change to black,? Hi there, i'd like to dye my chocolate brown sofa, do you think i could use a dark grey on it? Hi, I recently bought a dining table with marble top and 8 black leather chairs. The chairs look far too dark for the room and therefore I would like to make a lighter colour, like beige. What would be your recommendation? The chairs are studded so I want to avoid colouring them (or clean off colour afterwards). Appreciate your advice. Having read the instructions I'm very doubtful that this product would dye our aniline three piece suite successfully. 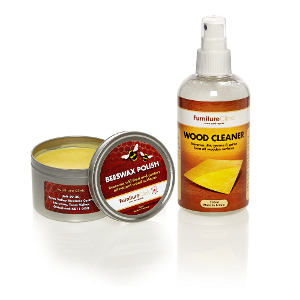 Although your product description confirms it is suitable for aniline leather. Please confirm it IS suitable for aniline as we would need to dye the entire suite due to darkened grease marks on settee which we've tried but cannot get rid of. Also would you be able suggest a professional to do the dying for us? Thank you. What size kit would I need to change a green reclining armchair to brown please? Thank you. Hi Katie. 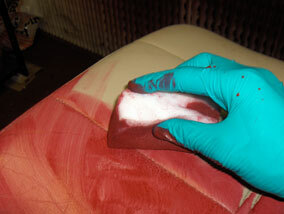 The medium sized colourant kit should be enough to cover a full armchair, where the large will do a sofa. hi i have a three piece suite, and i would like to change the colour . but i have a broken shoulder , so am wondering how much it would cost to do it professionally . Hi we would like to lighten a tobacco/dark tan coloured aniline leather sofa to a paler light tan/beige - can this be done? What product did you use to get a matt finish? I have a medium brown leather couch. The back, except for one panel, has faded dramatically to an almost blonde color. How do we dye the remaining panels to best match. Hi, I have some custom colour for 5+ years on the shelf. It is in a sealed bottle and I can see it now it has split into different parts. Would it be ok to use it if I mix them by shaking the bottle? If the colourant has not been shaken regularly within these five years then it is unlikely that you will be able to restore it to a able state. It's important when storing the colourant to shake the bottles now and then to prevent the pigments from settling. 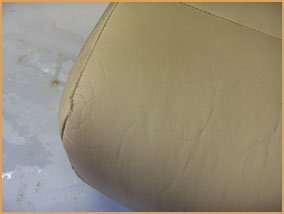 Hi, I recently changed the colour of my car seats from black to tan using the exact process as described above. However, I found that after sitting on them a couple of times the paint started to crack in some areas exposing the original black colour underneath. Before I applied the new colour, I made a concerted effort to make sure I removed all the existing finish from the black seat as I knew that if I didn't I'd be faced with problems but it still cracked anyway. Any ideas on why this happened or how best to rectify it? Hi The finish can be applied by sponge but you generally get a better result using the airgun. The airgun allows a more even coat to be applied and avoids unsightly brush strokes or sponge marks. Do you have a Canadian office? I would like to purchase a few of your products for my couch. What would I need for a couch that is both leather and vinyl? Hi Mimi, Our USA sister company, Furniture Clinic Inc. ship products direct to Canada. 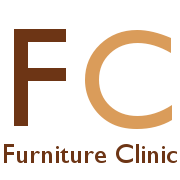 You can order from their website at www.furnitureclinic.com. Thanks, Jordan. Hi Which size of leather colourant kit would I need to change the colour of a large 3 seater sofa? Would changing the colour also remove the cracks and marks on it? Hi Generally the large kit is enough for a sofa. The kit will mend minor cracks but for more severe cracking it's worth getting the Flexifil or Heavy Filler as well. 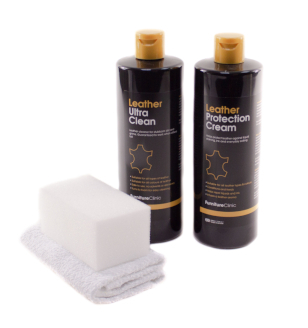 As for marks on the leather, it's a good idea to clean the leather with the Leather Care Kit. Hi Can you change a dark green leather chair to dark brown? What product should I use to fade/lighten 2 orange chairs? The orange is too strong and contrasting for the space we have. The leather is of the matt type. Hi You can change the colour of the leather using a Leather Colourant Kit. You can change the colour of the leather to any colour. Can you tell me how much leather dye l would need for changing the colour of a large leather chair? Hi The Leather Dye is not suitable for changing the colour of leather. For this would need a Leather Colournat Kit. For an average armchair the medium kit is enough, but for a large chair you may need the large kit. We have just bought the leather dying kit but the air gun has stopped working any tips how do get it working or can u send us a new one. Hi Debbie Please refer to the advice leaflet with the kit. If this fails to help please contact our office. Hi The leather dyes are only for colouring new leather, so I wouldn't recommend it for this situation. 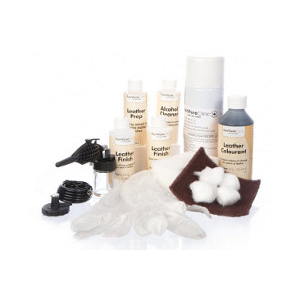 However, we have a Leather Colourant Kit which would be suitable. 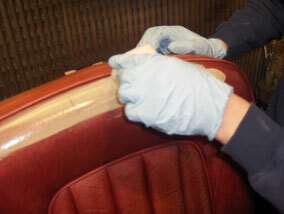 Hi The colourant flexes with the leather so it will not crack when you sit on on. Eventually the colourant will wear off but it will last as long as new leather under the same stresses and levels of use. I'd recommend the extra large kit. How much product do I need to buy I have 1 large 3 seater sofa 1 large 2 seater and a large single lounger.I want to dye it is not in bad condition but does have a slight stain which looks unsightly. I think people have sat on with sun cream on and sun cream has stained the leather. I need the cleaner + dye and finisher. Neil. Hi For the stain you'd need the Leather Degreaser. How much of this you'll need depends how much oil is in there and it can be difficult to tell in advance. I'd recommend starting with one tub. In most cases this is enough. For the colour I'd recommend a Leather Colourant Kit. Typically, the extra large kit is enough to cover a three piece suite. 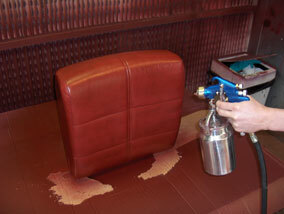 Hi Yes, you can change leather to any colour you wish using one of our Leather Colourant Kits. Hi Kayla You certainly can. We have a Leather Coloutant Kit which you can use to do this. You can change to any colour at all. Hello Regina Thank you for your enquiry. Our US office will be able to advise on the best products to use. 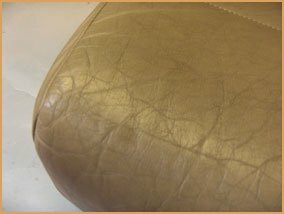 You can call (866) 931-8095 or visit www.furnitureclinic.com If you know what type of leather your couch is (absorbent or not), this will help to know which products to use. 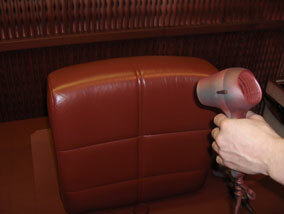 You can find out if your leather is absorbent by pouring a drop of water on a small part of the couch. If it soaks in after about 10 seconds, it is absorbent. 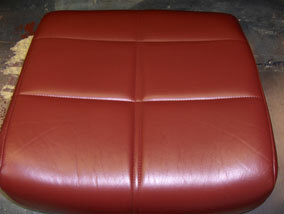 Absorbent leather can require different products to non absorbent items.